I've been working on this since May I think, but it was going pretty slowly and exhausting so it took much longer than expected. I should have planned it better too since I basically started with no solid concept, and for a wall that was suppose to take so much effort to complete, that was dumb of me. I was getting stuck a lot without any idea how to make it look good, and even now I think there was much more potential here. Whoa, you finished it after all! And with such a huge number of characters (extra kudos for the director and the deer) Guess a good deal even from regular vector artist would give up already be the half of this ammount, probably myself included. I always knew that you have a great creativity, the variety of your walls proves it, but seems like patience as well. 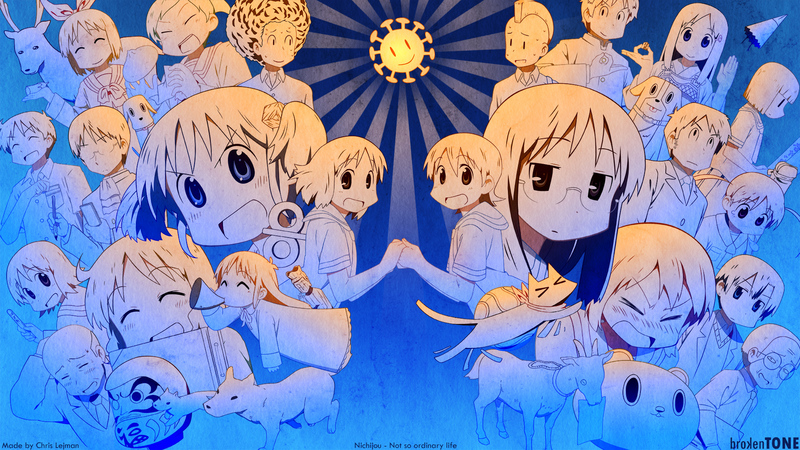 Hope this will help at least a little bit for Nichijou to get some extra popularity. I second the motion @aki about your great masochism in vectoring dozens of those characters which was really commendable but what was truly remarkable was how you've arranged them that we(the spectators) doesn't feel suffocated at all. Another thing to mention was the overall bluish color of this wall doesn't look like being washed out but rather it gives off a calming effect especially to the eyes. I definitely like it! And by the way HAPPY NEW YEAR! 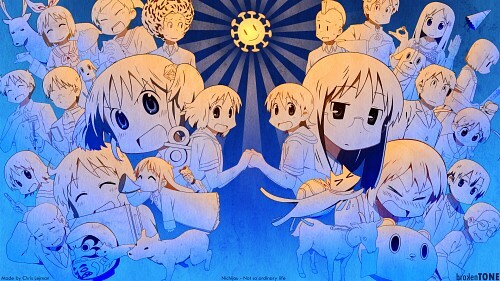 Let's support NICHIJOU! Nichijou! I can never get sick of this anime. I knew this had to be my new wallpaper when I saw it on the frontpage. It's awesome to see all of the characters here! It must be hard work. Kudos to you!